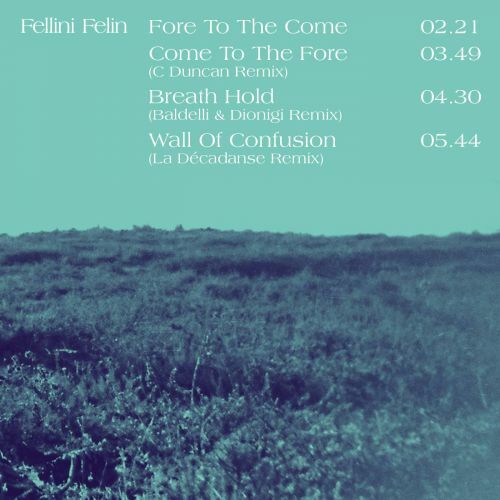 If you have not seen before, and this for allFellini Félin's fans, the producer-composer released his EP remixes in late July in the utmost discretion of summer. We bring a spotlight on our artist in this "été indien" period, starting with a reinterpretation of his titleCome To The Fore. As a desire to reinvent himself, he appropriates his own composition again in a semi-acoustic version, cradled by a modulated voice where piano notes are melting with hypnotic synth chords. Sébastien delivers here a fresh and calibrated vision of his nowFore To The Come. The three remixes that follow are paying tribute to Fellini Félin's first love for club music. In a style relatively close to the project, the choice of ScottishC Duncan(Fat Cat Records) was obvious. He brings here a touch of progressive synth-pop for a trip close to four minutes. The toughest remix of this EP is signed by the pope of the cosmic Italian discoDaniele Baldelli, this revered artist in the ranks ofDFAor evenGommadynamites the original tune with a sensual and warm approach for oozing dancefloors. Finally, behind the aliasLa Décadanse, the two Marseille friends Laurent Pastor and Marc Lapeyre punctuate this 4 tracks EP with a dark electronica - new wave remix.